You are cordially invited to a special PowerApps design and creativity challenge. Create your own single screen app, and have fun using creative thinking to make it interesting and easy to use. After you've made your app, don't forget to create a snazzy icon that helps to clarify the app purpose and attract attention in the app container! If possible have someone take a picture of you showing off your new app design on your phone, or just take screen shots of the user Interface and the icon. Tweet your images with the hashtag #ArtsyPowerApper on Twitter when you're all done! Two of you who play along in the challenge, and who submit designs that stand out in the areas of creativity and practical ease of use, will be gifted a special "PowerApps Design Master" t-shirt, as well as some fun PowerApps swag. Additionally, one person will be invited to join me in a community virtual meet-up. During the meet-up I will interview them for design tips they may want to share to inspire us all to create beautiful app forms! Looking forward to seeing what you come up with! The challenge starts today and ends on February 15th, 2017. The only rules are your app should be 1 screen (for mobile phone) and you must include a creative app icon! Challenge winners will be announced by February 25, 2017 on this blog and on Twitter! Here's an example of an icon and screen I made this week. I hope it inspires you to join our challenge and explore what creative twists you can innovate in PowerApps too! Business Scenario: There is a single green house where many plants are grown (to be sold at a later date). The Users of this app are horticulturists. They must be able to collect humidity and temperature settings in the room several times per day. The temperature readings will be analyzed to identify trends later on – no IoT this time….they are moving from paper and pen to PowerApps. 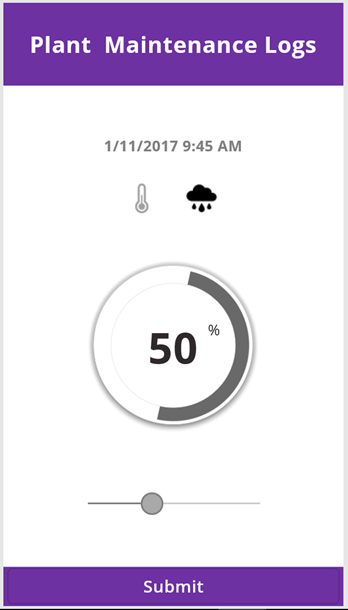 Approach: I have designed a single page app where they 1. select temperature or humidity by tapping on one of the icons, then 2. use the slider handle to drag to set the values they see on the equipment in the room, and finally 3. they submit the data to the SharePoint list (as easy as 1, 2, 3). (I suggest you first sketch your designs and pretend to use them on paper. I find that even in imagining my app in real life, that I can catch pre-build bugs!). I also always design a icon for each app so that it stands out in the gallery of apps on the phone or on our home page. Can you figure out how I did it? Tip: I created my media, shadows, and icons using PowerPoint! Did you discover the new Office icons there yet!? Wow, I love that new feature in PowerPoint! Come back Monday, as I will be posting my step by step how-to video on how you can do this in just 20 Minutes! Until then: give it a go! I am sure it will be a fun challenge.